Three basic principles govern how fast a car will go. Every worthwhile speed tip works to give your car the maximum benefit from each of these three principles. Gravity provides the energy that makes the car roll down the track. You can think of gravity as the engine in your car. Before the race begins, when your car is sitting at the top of the track, it has what is called potential energy. 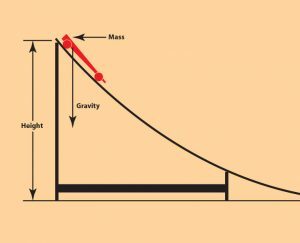 Potential energy is created through a combination of gravity, height, and mass (weight). 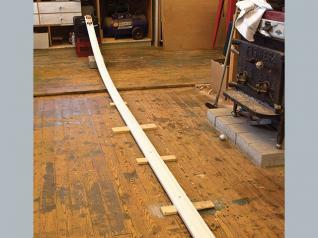 Cars with more potential energy will roll faster as they move down the track. To maximize the amount of potential energy in your car, place the weight toward the back, use as much weight as possible, and place the weights to create a perfect balance point. A well-balanced car with the weight in the back has more potential energy because the weight has farther to travel to reach the ground. Several different types of weights are available, and all of them come in a variety of shapes. Most Derby car experts strongly recommend using tungsten weights. A nontoxic metal, tungsten is very dense so it adds a lot of weight in a small amount of space. Tungsten is the most expensive option, but if you are going to spend money on one thing, buy tungsten weights, which are available at some craft and hobby stores and via online retailers. Use With Caution: Lead Lead is the next densest weight. It is widely available, it comes in a variety of sizes and shapes, and it is reasonably priced. However, lead is a toxic substance. Wear latex gloves or wash your hands thoroughly after handling lead. Not Recommended: Zinc Zinc weights, such as the breakable bars sold at craft stores, are inexpensive and easy to install. However, they are also about half as dense as lead so you need a lot of them to weight a car properly. It is difficult to place zinc weights effectively, especially on a thin car. Your car might have tons of potential energy, but not all of that energy gets converted into speed. Some energy is converted into heat as surfaces rub against each other, causing friction. The major sources of friction are the inside rims of the wheels striking the track guides, the wheel tread riding down the track, the wheel bore rotating on the axle shafts, the wheels rubbing against the axle heads, the wheel hubs rubbing against the sides of the car, and the friction of air flowing against the car as it rolls down the track. Even if you maximize the potential energy and polish the wheels and axles to reduce friction, if you just stick the wheels on the car, it will perform poorly. 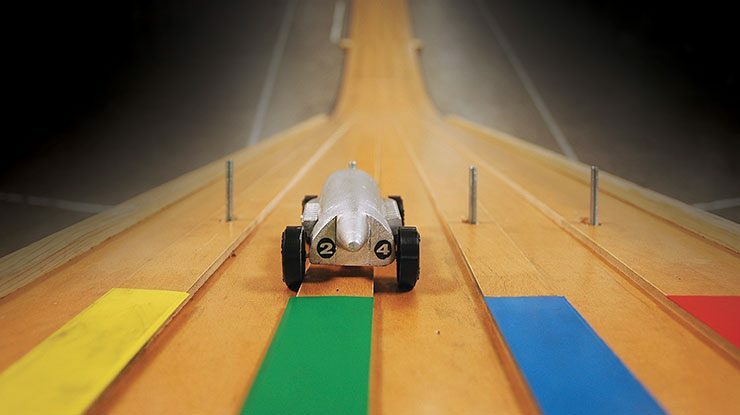 If the car bounces off the guide rail as it travels down the track, it will lose speed every time it touches the rail. Or, the back of the car might wobble back and forth when the car hits the flat part of the track, and that friction is like putting on the brakes. A finely aligned car will look like it’s accelerating down the flat part of the track because it isn’t losing as much speed as the unaligned cars. Read the sections about alignment to be sure the wheels on your car are perfectly adjusted and ready to race. 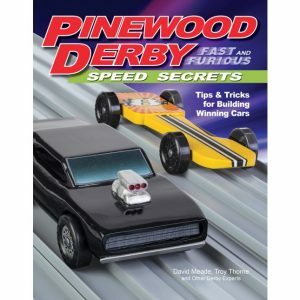 For more expert information on how to precisely position weights, reduce friction, and align the wheels properly, as well as other proven techniques and fast car designs check out Pinewood Derby: Fast & Furious Speed Secrets by David Meade, Troy Thorne, Jon Deck, and Other Derby experts. 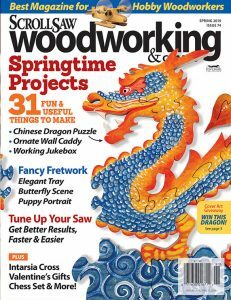 Available for $12.99 + S&H from Fox Chapel Publishing, product code 9043. 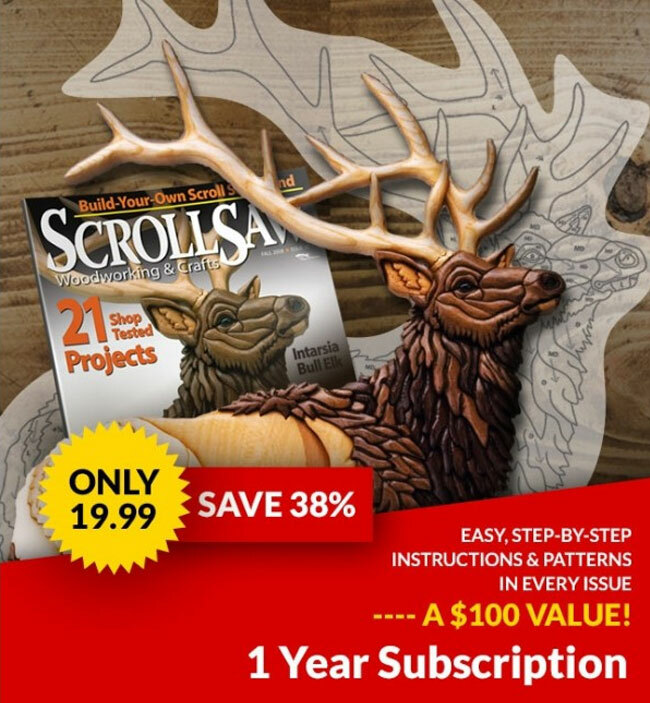 Once you pick out a design, Click Below to see a video on how to cut your car out with a scroll saw. 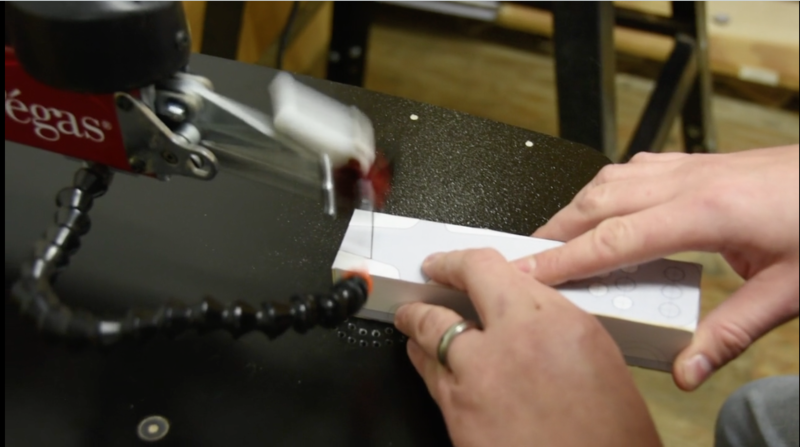 Making the Best Pinewood Derby Car from William Mahar on Vimeo. 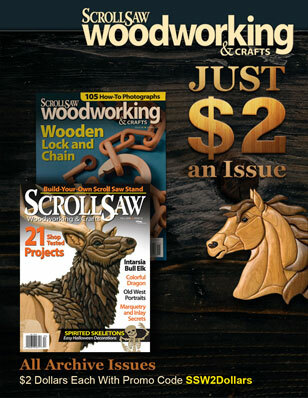 • CLICK HERE to purchase the latest issue of Scroll Saw Woodworking & Crafts. 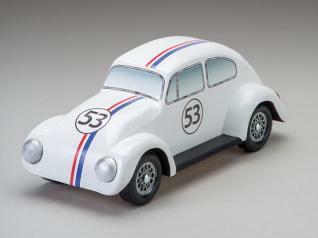 Pinewood Derby Special Issue from WCI Making a Pinewood Derby Track VW Bug Pinewood Derby Car Claim Your FREE Downloadable Mini-Issue!